Update 3: The saga continues. Due to reports of reset loops during the install process, Palm has temporarily taken the patch down to investigate. The move is the right one for Palm to make, despite the fact that it continues the drama of the 700p ROM update. Even many experienced users in the TC forums have had issues applying the patch. Update 2: The Sprint 700p update is available now. Still no clear word on when the Verizon update will arrive. Update: A new post indicates that the Sprint update will be available on Monday, but that the Verizon update is still up in the air. If that isn't a clear indication that the primary holdup at this point is carrier approval, I don't know what is. It seems to me that the best course of action for Verizon users at this point, since they have neither the 755p not the 700p ROM update available to them, is to start contacting Verizon directly - more on this in the forums. We appreciate the frustration that has been shared and everyone's patience. I know we said we are working to deliver the 700p maintenance release (MR) the week of May 28th. 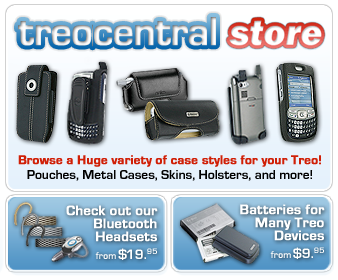 We are still hoping to make the MR available for Sprint Treo 700p users tomorrow or early next week. Unfortunately, the MR will not be available this week for Treo 700p Verizon Wireless users, but we expect it will be available soon. Palm had previously promised the update "the week of May 28th". Prior to that, of course, has been quite a lot of activity, consternation, and debate in the TreoCentral 700p forum. A quick glance at that forum reveals further consternation. I wish I could say I am shocked but I am not. I predicted that when Palm vowed the MR to be available in the last week of May pending carrier approval, between the lines they were really saying JUNE. Bob-C's sentiment is shared by many, including this author. After initially not realizing the scope of the 700p's problems, the TC community has more than brought me around to wondering exactly why Palm seems to have mismanaged this ROM update so badly. I have previously been very willing to give Palm the benefit of the doubt, especially as I agree that all the carriers have way too much power over Palm and its operations regarding the Treo. But at some point, the madness has to stop. That point is long past. Palm's Paul Loeffler has promised to update the Official Palm Blog with more information today. That is a welcome sign, as one of the core issues here is and has been Palm's poor communication about the issue. That communication problem seems to be on the way to being solved - what's aggravating is that the technical problems have also been solved, in the new Treo 755p. Loeffler's update should, I hope, explain what's causing the delay. There is speculation at PalmInfocenter that the ROMs inside the Sprint and Verizon are not as similar as most would assume. That likely accounts for some of the delay. Get it together, Palm, and hurry.